I am. I have so little self control. I flit off in this direction and that, I don't stick to it, I don't follow up, I don't stick to the plan or finish things. Well that last item is not true... I finish lots of stuff. I have a drawer full of socks, and other drawer full of hand knit scarves, and a huge storage bag of hats, that are a testament to the fact that I do, indeed finish things! But it is true, I get distracted. Cleaning up stash and finding a 25 yards or so of silk—it sits around, homeless, wimpering to be knit up. Into what? What can I do with 25 yards of silk?? And then there was the small skein of bamboo and silk. Maybe enough for fingerless gloves (there was 180 yards or so) but did I need/ did I want some dressy fingerless gloves? I dunno. Then I saw, in some magazine I was looking at, a pretty, lacy victorian collar.. Oh that's nice. So I cast on with the silk—I used a bit more than half--(over 200 stitches) and then worked the bamboo in no pattern chevron--well no specific pattern--I've made over the years a number of chevrons, and just know how to do one. I added a few rows with yarn overs to make it a bit lacy; and a few rows of purl to keep it flat, and add some texture-- Just LOOK! It's almost a collar in no time at all! 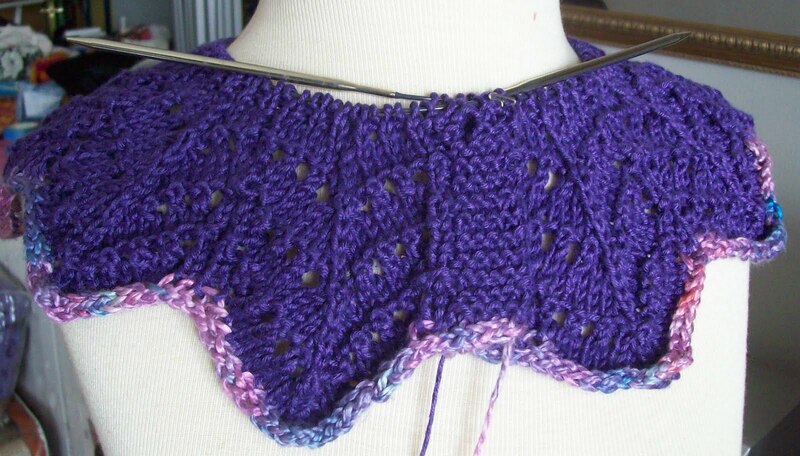 A bit if ribbing now, then a row or two of the remaining silk, and finally a soft lacy ruffle to fall over the ribbing. A fancy silver button or two (the first button hole has just been made) and it will be done. The silk matches/co-ordinates well enough--and makes the plain purple bamboo and silk blend sing. A pretty bit of collar to keep my neck warm—but not too warm. Pretty enough to wear all day, not just inside of coat. Meanwhile, the swirl socks have 2 rows of the heel flap completed—and will be worked on intermittently as I finish this up. I have to finish them up, visions of more lacy scarves and more hats, and more fingerless gloves keep clouding my vision! It's going to be an effort to stick to just one project! it's pretty! And I think that is very disciplined to actually *use* your stash, rather than continuously enhancing it. The collar is beautiful! And a perfect use for the yarn. I don't blame you for getting distracted.